Outdoor furniture can transform your backyard, patio, deck or front yard into a relaxing retreat and enjoyable gathering place for you and your family. Outdoor furniture adds comfort and function to your outdoor spaces. Outdoor furniture is made from a variety of materials, each with its own look and feel. Materials can include wood, aluminum, wicker, wrought iron, plastic and more. Each material type will be different when considering weather resistance, durability, and maintenance requirements. 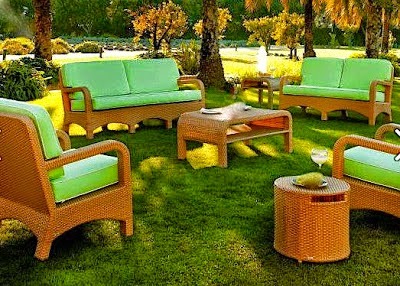 The weather where you live plays an important part in the kind of outdoor furniture you select for your outdoor space. 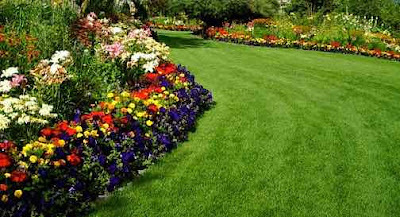 Consider the way in which you want to use your outdoor space. Consider your climate, lifestyle, budget and the interior design style of your home when selecting your outdoor furniture. Make sure you measure your available space and have those measurements when you go shopping for the furniture; to ensure everything will fit comfortably. Pick outdoor furniture pieces that have high-quality materials, are durable, and are easy-to-maintain. Research and read several consumer reviews before you make a big purchase. Find out what the maintenance requirements are before purchasing an outdoor furniture set: Aluminum is one of the most long-lasting materials especially if you live in a cold environment. Wooden furniture is very traditional and popular but will require more maintenance and repair. Metal rusts easily if it is kept out in rain or winter but if you can maintain it properly, you will have an exclusive look. Plastic is durable and needs less maintenance but it gets easily discolored, faded and scratched. Plastic furniture tends to look of low quality and is not easy to match with any home décor or design style. 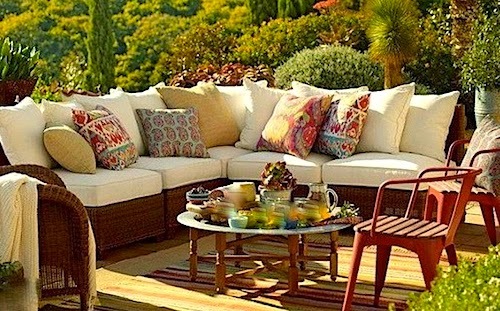 Wicker furniture should be kept in the shade because it can be damaged by direct sunlight. 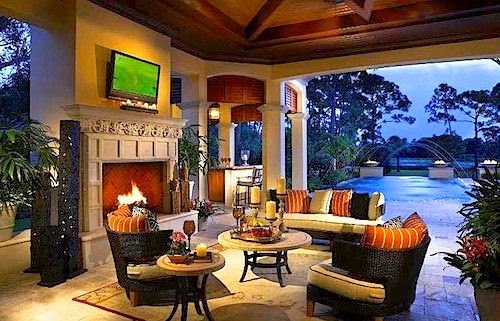 Make sure the design style of your home is reflected in your choice of outdoor furniture. For example glass and metal furniture goes well with contemporary style homes. Wood and wicker furniture goes well with traditional style homes. 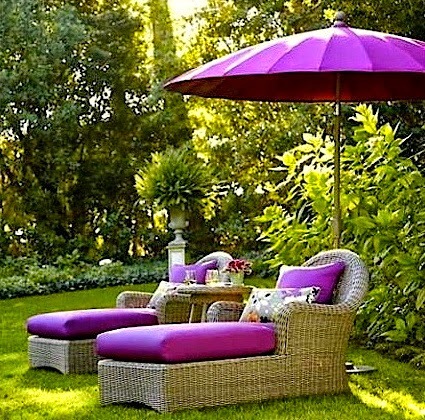 Make sure the color scheme of your outdoor furniture is harmonious with the colors in your landscape design. Make sure you leave sufficient space for people to freely move around your outdoor furniture. Use large outdoor furniture on an expansive deck, use small outdoor furniture in a small outdoor space and mix one large furniture piece with smaller furniture pieces in a medium-sized space; this will make your outdoor space both comfortable and stylish. Try any new outdoor furniture in the store before you purchase it to make sure it’s comfortable, durable, secure and reliable. Try to buy a mix of pillows with different patterns and colors, this will add texture and color to your outdoor space. Select bold colors for cushions and accent pieces. Use fabric cushions with your outdoor furnishings to boost the comfort and the appearance of your outdoor furniture. Select outdoor furniture with cushions that can be unzipped and taken apart for repair or replacement. Look for cushions that are waterproof, washable and mildew and fade-resistant. Look for cushions with polyester or acrylic filler to resist mold and mildew. Make sure table legs and chairs have plastic or rubber feet that won't scratch your deck or patio. Look for outdoor furniture that is simply taken apart for compact storage; if your storage room is limited. Consider storage such as a basement, shed, or garage for your outdoor furniture during rain, snow and cold weather; to protect your outdoor furniture and to make it last longer. Invest in outdoor furniture covers if you don’t have storage space to protect your furnishings and to keep your outdoor furniture dry until it is ready for use in sunnier weather. 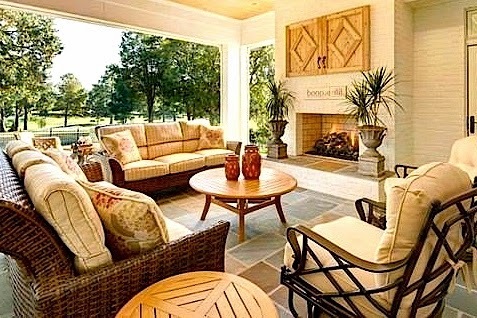 Whether your goal is to design an outdoor space for entertaining, dining, and gathering or to create an outdoor space for a quiet retreat, you should select the right outdoor furniture for your patio, front yard, backyard or deck to ensure that you are able to spend enjoyable occasions with your family and guests, in a welcoming and comfortable space.